I had to buy them. A coworker and I visited a farmer’s market on our lunch break, and there they sat quietly, piled up in a basket at the far end of the table. Purple potatoes. They were smaller than the basic red-skinned potatoes I usually buy for roasting and smashing and all other forms of tatery goodness, and they weren’t cheap, but they were purple. My inner seven-year-old squealed “purple!!! !” and I forked over the money. Well, my friends, it turns out that unlike red potatoes, whose beauty is only skin deep, the vivid purple shade of this variety goes right to the core. I don’t know what species I purchased; there are several varieties of blue and purple potatoes in existence, and the sign said, unhelpfully, “purple potatoes”. If I return to the market, I will ask the farmer about their lineage. Normally, in the nutrition world, brighter and deeper colors indicate healthier food (Cheez-its and Kool-Aid notwithstanding). So, what’s with the purple? do they taste purple? Are these potatoes healthier than red potatoes or Russets, and should I keep shelling out more money for them? As far as flavor goes, my experiment with roasted garlic purple potatoes resulted in… roasted garlic potatoes. With my eyes closed, I’m confident I would not have been able to tell the difference between a red or a purple potato prepared in the same way. And these looked so incredibly cool on my plate beside the chicken! I did a little digging, and it turns out that the purple color is from high levels of anthocyanins, which is the same antioxidant that makes blueberries a “superfood”. Proof once again that sometimes “ingredients you can’t pronounce” and “chemicals” can be damn good things to have in your food. * In all honesty, the jury is still out on whether the antioxidants and other compounds in blueberries and other fruits actually make as big a difference in vivo (in your body) as opposed to just in the lab, but I see no reason not to add as many colorful foods to your diet as you can. My educated guess is that these potatoes are marginally better for me than the average white-fleshed potato, but not by a whole lot and probably not enough to justify the extra cost on a regular basis. That said, I bought more. I plan on boiling and mashing them this time, because apparently anthocyanins are water soluble, and I want to see if the purple washes out with boiling. Science! * I still find myself getting pissed off to an absurd degree when I hear natural-foods people railing against “chemicals”. If you’re against pesticides, or artificial coloring, or preservatives, say so. Oxygen is a chemical, for crying out loud – don’t be dissing chemistry as a whole just because you don’t understand it. This entry was posted in Food, Uncategorized and tagged potatoes, recipe on July 10, 2012 by antijen. 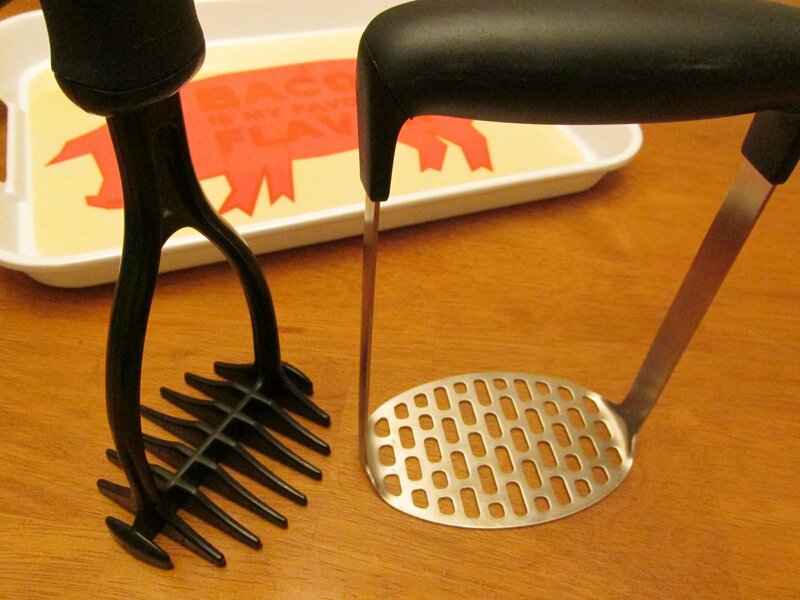 I do not use my mandoline slicer enough. That thing is so damn cool, making those perfect little slices. Since I bought a huge bag of russet potatoes on sale last week, I figured it was an ideal situation for scalloped potatoes. I more or less followed this recipe on allrecipes.com for Creamy Au Gratin Potatoes. I bumped up the serving size to 6, because I wanted to use up more of my potatoes, but that was dangerous because I had enough sliced potatoes to get right up to the edge of my baking dish. For simplicity’s sake, here’s the ingredient list along with my inevitable tweaks. This will make enough for either an 8×8 dish or a deep pie plate, which is what I used. Technically 6 servings, but it’s so delicious you’re realistically looking at 4. I used less milk and less cheese than the recipe calls for, and I added thyme, garlic, and bacon salt. I would have added actual bacon bits but I didn’t have any bacon in the house (a problem which will be corrected on my next grocery run). The recipe, as written on the allrecipes site, seemed a little bland without any seasoning, so I figured I couldn’t go wrong with garlic and thyme. The recipe also had me putting the raw onions between potato layers, but I figured cooking them first would have a better result. Soften the onions and thyme in a small pat of butter on medium heat and set them aside. Peel two garlic cloves and smash them flat with a knife so all their guts are hanging out but they’re still more or less holding together. Melt the butter over low heat and whisk in the flour to get a nice silky sludge – cook that for a minute or so until it changes to a golden color, then stir in 2 cups of milk and your garlic cloves, and cook, whisking like mad, for a few minutes until it thickens up. Take it off the heat, add salt and pepper, fish out the garlic cloves with a slotted spoon, and then stir in the grated cheese. Set the oven for 400. Peel, then slice the potatoes with a mandoline slicer, or with a knife if you’re a masochist. Generously grease the bottom of your baking dish with butter or a cooking spray, and layer some potatoes in. Add some of the onions on top, then a little sauce, then more potatoes. Keep going until you’re at the top of the dish, then pour as much of the remaining sauce over the top as you can without making a mess. Press down on the gooey mess with your hands to force the sauce between the layers. If you’ve been adding sauce as you layer, you may not need to do this part. If your sauce has thickened up too much while you were peeling and slicing your potatoes, just whisk in a little extra milk. Sprinkle a little bit of bacon salt over the top layer and then add a small handful of grated cheese, then put the baking dish on a cookie sheet to catch bubble-overs. Put that into your oven for about an hour – pull it out after that long and check it with a sharp knife. If you have to force the knife through, put them back in for a while. If the knife goes through the potatoes with only a tiny bit of resistance, they’re done. Let everything sit and cool off a little once the potatoes are cooked, because that will let the sauce thicken up a so the potatoes hold together better when you scoop them on to a plate. 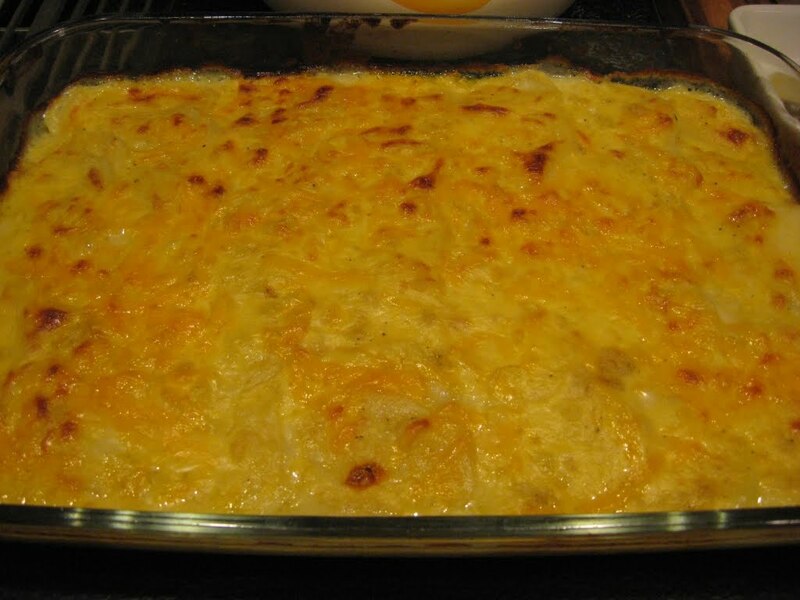 I just now realized this is very similar to the “Cheesy Garlic Scalloped Potatoes” I posted about last year, but I already took all this time to write it out, so it stays. For some reason, the Blogger search doesn’t always pull everything up, so when I searched for “potatoes” to see if this was a repeat, it didn’t turn up. I only caught it because I decided to edit my old posts to add a “potatoes” tag. Oh well. At least my spices were different this time, and the cooking time and temperature were different because I used a smaller dish, making a taller stack of potatoes. Does that make it different enough to count as a new post? This entry was posted in Food, Uncategorized and tagged potatoes, recipe on October 3, 2011 by antijen. So sue me, I’m tired of mashed potatoes. I even tried jazzing them up by stirring in onion dip last time, and while it was tasty, it was still mashed potatoes. The magic is gone, and I think I need to see other potatoes for a while. New mandolin slicer + bag of potatoes I refuse to mash = scalloped potatoes! I guess it could also = chips, but I wasn’t in a deep-frying sort of mood. I peeled the potatoes and ran them through the mandolin slicer without hurting myself, which is an accomplishment. I want to buy a chain mail glove to protect my clumsy hands, but for now I went slow and used the special food holder that comes with it, and the only downside was the 7 small chunks of wasted potato from the bit that stays stuck in the holder. I sautéed the onion in butter until it was soft, and then whisked in the flour with some salt and pepper, and let it get brown. Whisked in the milk and then let it come to a bubble, then added the garlic cloves and then eased up on the heat and let it simmer a while to thicken. I had to keep whisking occasionally to keep stuff from sticking to the bottom. Once that looked ready, I fished out the garlic cloves, and then stirred in the cheese. I sprayed a baking dish with cooking spray and then poured some of the sauce into the bottom to coat it. Then I layered in the potatoes, taking much more care than I should have, because it really doesn’t matter. But I did it right this first time, overlapping the slices slightly till I had a whole layer, then pouring sauce on it, then another layer, etc. I had three layers by the end, and then I topped it all with the rest of the sauce and some extra grated cheese. Popped that in the oven at 350 for 40 minutes and it was perfect. Next time I’ll probably just throw all the potato slices into the sauce and pour the whole mess into the baking dish, because the layering doesn’t matter and you can’t even see it except for the top layer, and that was covered in enough cheese to camouflage it anyway. This entry was posted in Food, Uncategorized and tagged potatoes, recipe on December 3, 2010 by antijen. When I first came across this recipe, it called for actually baking the potatoes and scooping them out to use in the soup. While I’m sure it gives the soup an extra kick of authentic “baked potato” flavor, who has time to bake a bunch of potatoes, only to gut them and turn them into soup? First you boil up the potatoes so you can mash them. They cook faster if you cut them into smaller chunks. When you can stick a fork through the pieces, drain them and dump them in a big bowl and mash them roughly. You want to leave them chunky, for texture. I normally don’t even use my potato masher, I just go at them with a fork. Don’t add butter or cream or anything. Next, fry up the onion with the butter in a big soup pot until the onions are soft, then whisk in the flour and let it brown a bit while you keep frantically whisking it. Then, still whisking, start adding chicken broth slowly. Start by only adding about 2 cups, then add the cream and the thyme and let it heat up until it gets frothy from the cream boiling, then turn down the heat. Stir in the mashed potatoes and blend them gently into the soup. Don’t whisk them in or you’ll break up all the chunks and it won’t be as good. At this point, if the soup is too thick, add more broth to thin it out. I dumped the whole box in this time figuring I’d be fine, and ended up with a really thin soup, so I stopped and cooked up 3 more big potatoes to mash and add to it. Since this takes a lot longer, I recommend starting with less broth at the beginning and adding more as needed. 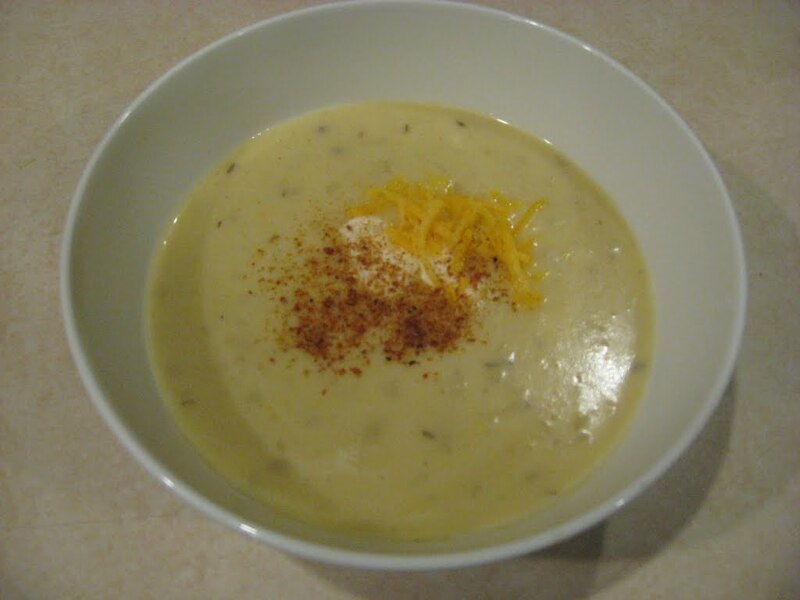 When it’s time to serve, stir in the cheese so it melts – if you use normal cheddar you’ll have an orange tint to the soup. Then you can stir in the sour cream. When you serve this it’s fun to add a blob of sour cream and a bit of cheese to the bowl, making it look all restaurant-fancy. I also cooked up bacon for bacon bits the first few times I made this, but I since discovered Bacon Salt in all its glory, and now I sprinkle that over the soup instead. I suppose you could use chives instead, if that’s your thing. This entry was posted in Food, Uncategorized and tagged potatoes, recipe on November 21, 2010 by antijen.